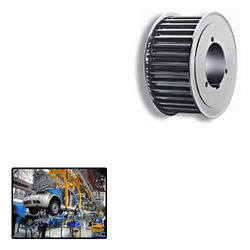 Pioneers in the industry, we offer timing pulley for automotive industry from India. We are instrumental in manufacturing and supplying an excellent quality array of Timing Pulley for Automotive Industry that is used in automotive and engineering industries. The offered pulley is manufactured using excellent quality raw material and the latest technology as per the industry standards. Our quality experts meticulously test this pulley on various quality parameters so as to ensure its quality. Besides, we provide this pulley in variegated sizes and designs at nominal price. Looking for Timing Pulley for Automotive Industry ?